Well here it is on YouTube. They misspelled my name and everything, but you can't win 'em all :-) Thanks for all the text messages, Facebook comments and stuff! Learn from chocolatier Benjie Pedro (and get to taste some chocolate too!) FOR FREE!! Do yourself a favor and attend :-) Read my account of the first time I went. Ah the stuff you find in the supermarket snack shelves! I never stray near the snack shelves anymore but Mama found these little numbers on her latest visit. (ingredients: high-grade cherry tomatoe, sugar, salt). I'd totally buy this stuff again. Consider the possibilities: wouldn't they be just perfect on my olive oil gelato?! I didn't like the olives. First of all, can someone tell my why there's a picture Saint Petersburg on the front? Well ok not St Petersburg, but it does make me think of a Russian church. The olives look like they're of the Kalamata variety, but that's no Greek building. The product name is Oliva Senorita. Spanish? I'm sorry, maybe there's a Moorish-influenced building in Andalucia that I'm unaware of. Whatever. The stuff smelled and tasted like champoy (chinese fruit plums) but with a far less pleasant texture. Ingredients list: Olive, liquorice, sugar, salt, citric acid. I didn't taste any olive in this though. Not buying that again. I don't know how new these products are but they're certainly new to me. I hope they keep making the tomatoes. This might be the best time to stock my pantry with this as tomatoes are at their best in the summer. Of course the manufacturer could conceivably process enough of these to last til next summer. Who knows. I will be paying close attention to the packaging date. A few nights back I cooked some chicken in red wine and Herbes de Provençe for dinner. A somewhat overly hearty meal for such a balmy night, but we enjoyed it. What would've been great is a glass of cold, cold rosé. It got me thinking back to just such a glass I enjoyed a few weeks ago at Cafe Provençal. Café Provençal hosted a bloggers' pizza & wine event to promote their "Summer in Provençe" theme which will run all summer long. One of our very gracious hosts, Kathleen Chua, explained that during summer in Provençe people will often sit and talk with friends while sipping rosé wines, an experience they hope to introduce here in the Philippines. 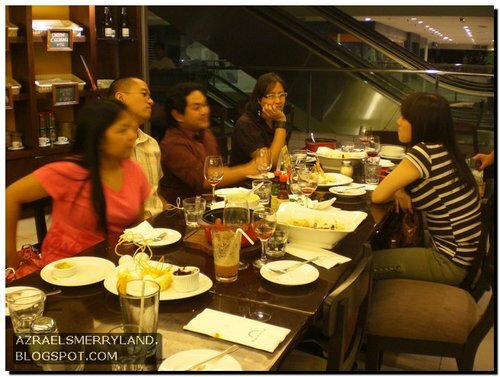 Most Filipinos are only aware of red and white wine, and are not very familiar of rosés which are fruity and light and go well with pizza. The folks at Café Provençal hope to change all that, and hope that these wines will catch on in the Philippines. For their summer theme house chef Jacq Tan took the Neapolitana Pizza (thin crust, tomato sauce, mozarella, drizzling of olive oil) and created four variations which we were able to sample. We started with the Roasted Garlic Pizza (cherry tomatoes, fresh basil, chilli flakes), a rustic, very fresh tasting number. I asked our hosts whether their ingredients are locally sourced, and Bryan Chua said yes, explaining that they are aiming for freshness of ingredients instead of importing ingredients that will sit in an airplane somewhere for days. It's a good move, and it was evident in the flavor of the pizzas. Next up was the Asparagus Pizza (asparagus, sundried tomato, ricotta). Those who know me best will tell you I won't hesitate to put weird stuff on my pizza, and asparagus isn't anywhere near weird, but it did surprise some of my dinner companions. More surprises with the Tarragon Chicken Pizza (strips of chicken, fresh tarragon leaves, and ricotta). This was Steph's favorite. What was a pleasant surprise to me was the use of dark chicken meat with the skin on to add a little crunch. The age-old pairing of chicken and tarragon worked really well here. My compliments for the pizza crust! My pizza test is whether the crust is good without any toppings, and this did not disappoint. No wood-fired oven here obviously, but still very good. A nice touch accompanying the pizzas were the small plates of fresh basil leaves, dried chilli flakes, and sea salt (nope, not fleur de sel...that might be asking for far too much hehe). The fourth pizza was the Spicy Chorizo (chorizo, red onions, bell pepper) which I felt was the weakest link not because it wasn't good, but because the three other flavors (in my opinion) far outstripped it. Maybe it would have stood out better paired with the Torres Viña Esmeralda that I saw on the wine shelves instead of the rosé that we were having. Speaking of the wine, we were served ALEXIS Syrah Grenache Rosé in chilled glasses (another nice touch...bravo!) and 2007 Chateau de Roquefort CORAIL Cotes de Provence. Very good pairings with the pizza. The Syrah-Grenache was a little bit headier than the second wine but I found that my palate enjoyed it more. Other stuff we enjoyed that night were "Pasta Provençal," their version of pasta puttanesca, and "Burgundy Beef", their own version of Beef Bourguignon, or beef braised in red wine. The beef was falling-off-the-bone tender. The sauce was very nicely done, and wasn't even the tiniest bit greasy despite being very rich. The side serving of garlic mashed potatoes (a little chunky, just the way I like them!) helped cut into the richness, as did the successive glasses of wine hehe. For dessert we were served beignets with chocolate sauce, and a dollop of crème fraîche. Nice and simple. These were very good, the lightest beignets I had ever enjoyed. All in all a very good meal enjoyed the Provençal way: with some old friends and a lot of new ones, with good wine and conversation. Kudos to Café Provençal for the nice touches and their efforts to create an authentic Provençal summer experience. "Summer in Provençe" will run all summer long. You still have this weekend to catch the pizza & wine. Next month they will be offering different pastas, and I am definitely going back for that! 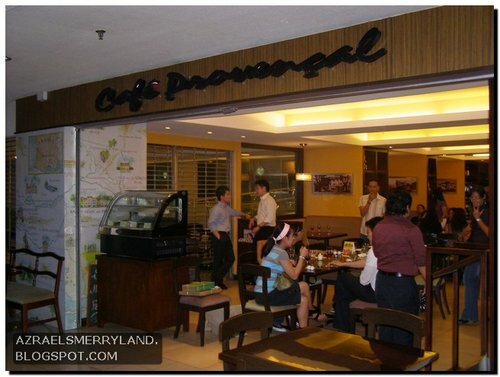 Thanks to the folks at Café Provençal and to Paul Pajo for organizing the event. It's 4am and I'm enjoying a nice bit of hot chocolate. I've been a fan of chocolate all my life. I grew up in Batangas which is tablea land, and in my godmother's yard there used to be a cacao tree. Imported chocolate bars weren't as readily available back in those days before globalization, and my mother used to limit after-meal chocolate to one-square rations. I guess she figured my brother and I were hyper enough without the theobromine rush. Back in those days I thought that the Goya Fun Factory actually existed and the big dream was to dive into the chocolate pool. Of course after seeing the fate of Augustus Gloop in "Willy Wonka and the Chocolate Factory", my enthusiasm was tempered a little. I learned to temper chocolate in culinary school. We worked with white, milk, and dark Callebaut couverture. That's when I decided I wasn't going to be a chocolatier, because it broke my heart when tiny bits of chocolate got left on the utensils and in the piping bags and stuff. I wanted to eat it all! And so when I got the invitation to Benjie Pedro's "Chocolate Appreciation 101" at his shop Heavenly Chocolates. I was in it for the chocolate tasting. 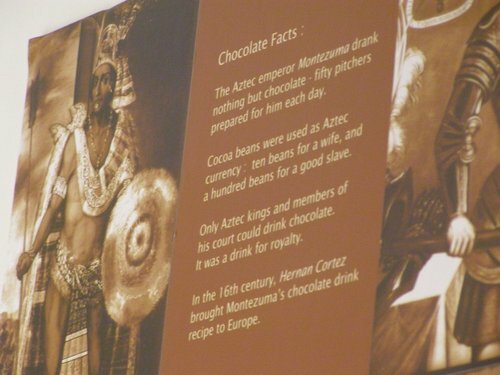 I wasn't uninitiated, and I knew all about the history of cocoa, the different bean varieties, cacao harvesting, the many stages of chocolate processing and all that. That's what I thought. Little did I know that I was about to have my mind blown. The session begins like an AA meeting "I'm Benjie Pedro, and I'm a chocoholic," and then Benjie took us on a journey peppered with fun trivia, candid revelations and personal anecdotes from travels around the world chasing the food of the gods. What was very new to me was single origin chocolate. Like fine wine from grapes grown with care, these chocolates were just as luxurious and unique. Ghana (mostly Forastero beans) was smooth and gentle, with notes of coffee. Madagascar (Criollo) had hints of citrus, with a fruity finish. My favorite was the Ecuador (Arriba a different variety of Forastero), very dark and bold, not for the timid. Benjie's passion for chocolate is infectious. He treats chocolate with both the sophistication of a wine connoisseur and the playfulness of a kid in...well, a chocolate store. Benjie had us sample some Sachi Nama chocolates. Nama is all the rage these days and the reason is obvious. I have not tried Royce's, but many of those in the know say they prefer Sachi. He also has some other tricks up his sleeve. One of the offerings at Havenly Chocolates is penne with chocolate sauce. The dish was good though not quite mind-blowing. It's still well worth a try for anyone who has never had chocolate in a savory dish. The chocolate-coated potato chips were a treat, as was the chocolate fondue (choose your single-origin to go with it). Benjie is all for challenging the senses; he got us to try something in development and not yet on the menu. I'm looking forward to going back to Heavenly chocolates tomorrow. Benjie says he has some new single-origins: Mexico and Bolivia. March 28th at 2PM and 6PM. For details, please call the shop at 666-22-08 or email Benjie Pedro at benjaminvpedro@yahoo.com. 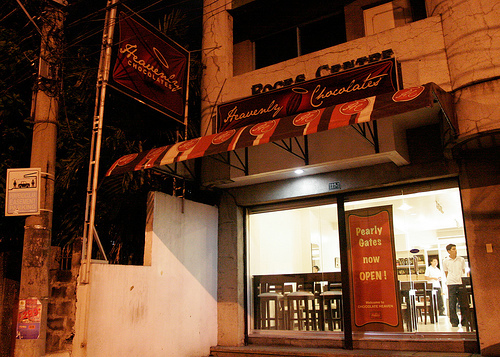 127 Roces Avenue (near corner Tomas Morato), Quezon City. 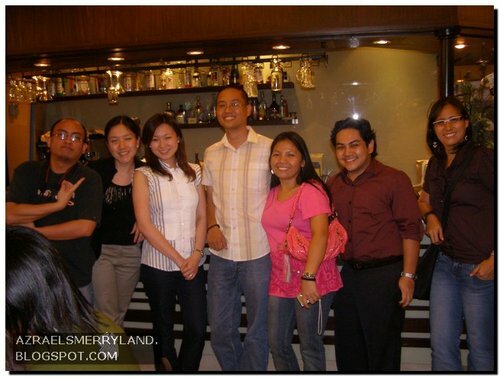 Sarah, Benjie Pedro, me, and Steph. Photo by Azrael Coladilla. Time to renew my presence in the blogosphere. It's my first blog entry for the year. I'm aware that the first quarter is almost officially over, and my backlog is 5 months long. In restaurant kitchen parlance I'm "in the weeds" but I'm going to fight back! I've got a few recipes in the works and I was planning to do some kitchen testing this week so I decided to pick up some ingredients on my way to Cafe Ysabel. I stopped at this great baking supply store (which I will not name here as I really like their store, and I don't want the store name associated with a negative post about something else) to pick up some almond flour and some powdered sugar. Parking was full so I double-parked and popped into the store to buy my items. I'm waiting my turn at the counter, having spent barely two minutes in the store, when I notice a commotion outside. I'M BEING TOWED!! Yessir, those boys pulled up with the tow truck and had my car hooked up in under two minutes! Your taxes at work. Very nice. I'm joined outside by the store manager to plead with them but they're not budging. It's 12noon. My car is lunch. Forget the almond flour, I'll need the cash to bribe these misanthropes pay the city fine. I spend the rest of the afternoon back and forth in the pouring rain with no umbrella from city hall to impound and back again twice. Long story short: The box of powdered sugar worth 48pesos cost me, among other things, Php1,100 in fines, Php60 in tricycle fare, 1 rain-soaked t-shirt, mud all over my best pair of dress pants, and 1 missed lunch. What a day!